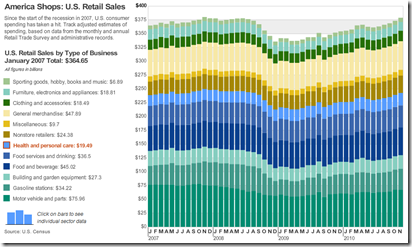 A beautiful data visualization of retail sales by type of business. I usually hate stacked bar charts because you really can’t compare what’s happening to any stack except the bottom and the total. The WSJ solves that problem by letting you click on any individual sector, which smoothly animates into a chart of just those bars. Well done! It would be interesting to see this done for the components of GDP. 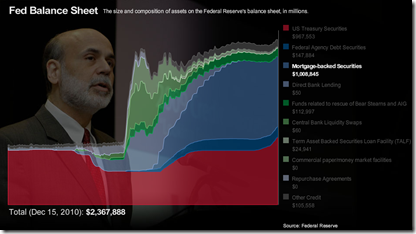 Update: Philip Izzo pointed out to me that the WSJ’s interactive area chart of the Fed’s balance sheet (below) also allows the same kind of drill-down. In addition, both of these are updated regularly as new data is released.